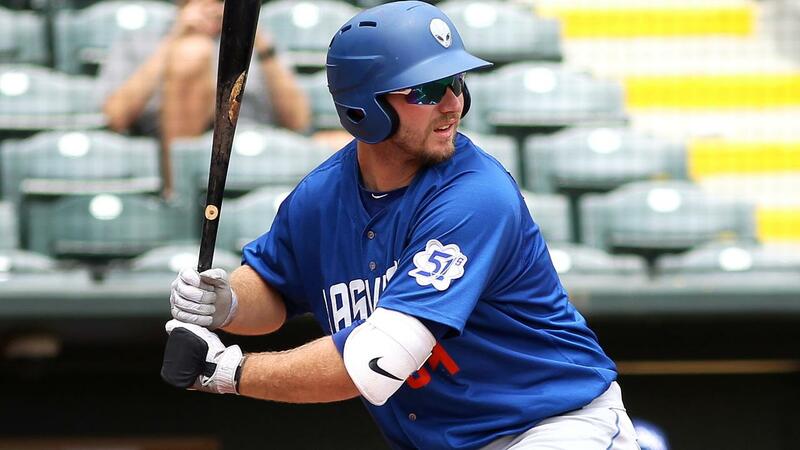 LAS VEGAS -- The last time Peter Alonso played in Las Vegas, he was clinching the Joe Bauman Award in dramatic fashion, hitting a two-run walk-off home run for what ended up being the last play in Cashman Field history. On Monday, he was back to accept the prize in a more official -- and hilarious -- fashion. The Mets' No. 2 prospect was presented with the Bauman Award at the Minor League Awards Luncheon during the Winter Meetings at Mandalay Bay Resort and Casino. Alonso finished the season tied atop the Minor League leaderboards with Reds prospect Ibandel Isabel with 36 homers apiece. Alonso took the RBIs tiebreaker to garner the award, collecting 119 -- the most in the Minors -- while Isabel racked up 78. Before stepping up to the stage to accept the award in front of a crowd mostly filled with Minor League team employees, the 24-year-old first baseman realized he didn't have much of a speech prepared. That's when he remembered one specific piece of advice he received from his Triple-A Las Vegas manager, Tony DeFrancesco, about four weeks after he'd been promoted from Double-A Binghamton. "One day in his office, he pulled me in and said, 'Listen, if you're having a family dinner, you've gotta have a special sauce made,'" Alonso told the crowd, mimicking DeFrancesco's voice. "'And you know what, you have all the ingredients nice and perfect. You need to have everything all set. But then, your family members start messing up. They put a little too much garlic, a little too much tomato, a little too much salt. You know what? The sauce tastes terrible and dinner's ruined. You're left with only noodles. Capisce?' I had the same reaction as you guys. But after I thought about it, it makes sense. So pretty much what he was trying to convey in his messed-up way was stick to who you are. For me, it's just 'see ball, hit ball.' Sticking with that approach, it made me have a really successful year." Alonso could say that again. The 2016 second-rounder was one of the Minors' most productive hitters, beyond what he did in the power department. He produced a .285/.395/.579 line over 132 games between Double-A and Triple-A. He participated in the All-Star Futures Game in Washington, where he hit a majestic blast to left field -- one of a record eight long balls that day. He finished his 2018 season in the Arizona Fall League, where he finished tied for the lead in homers again with six in 27 games. Many Mets fans would have rather seen MLB.com's No. 58 overall prospect end 2018 in Queens. That's all a testament to the slugger's ability to break out after only 93 games in 2017 -- meant to be his first full season -- due to a broken left hand. And yet, all he kept coming back to was DeFrancesco's advice Monday. "He's your weird Italian uncle," Alonso said after the luncheon. "He has these weird -isms. He's not that at great explaining them. But after thinking on them a while, [you realize it's] you're at Triple-A, just be yourself, like you're going to be successful." Even though he ended 2018 as a Fall Leaguer instead of a Major Leaguer, Alonso is still expected to head to camp with the real possibility of becoming New York's Opening Day first baseman, following last week's trade of Jay Bruce to the Mariners. New GM Brodie Van Wagenen went so far as to tell New York radio station WFAN he thinks Alonso has the inside track on the job -- a concept that jives with the typical front-office concerns over service time. Van Wagenen backed up his willingness to make Alonso a big part of the club's present, never mind future, by having dinner with him in Arizona while the first baseman was there for the Fall League when the executive was heading to the General Managers Meetings in California. "He was telling me everything to excite me, not to stress me out," Alonso said of the meeting. "Pretty much just, 'If you do your part, just show up and have fun with it.'" Doing Alonso's part goes back to his hitting philosophy that might sound basic to others but has him on the cusp of bringing his prodigious power to the Majors in 2019. "I know it sounds really simple, but a lot of my teammates called me 'Caveman' because of [the phrase], 'Ooh, see ball, hit ball.'" Alonso said during his speech. "I even had a nameplate on my locker at Double-A that said 'Oog'. That approach worked and now Oog's getting an award."